Thank you for giving us the opportunity to serve you with your bakery needs. In 1946, at the end of World War II, my parents, aunt and uncle decided to open The Sweet Shoppe Bakery in High Point, NC - their hometown since birth. 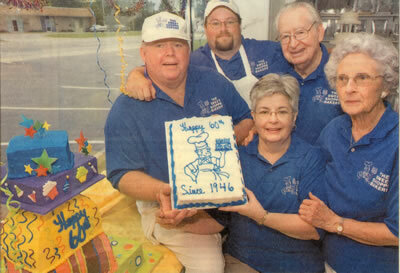 My parents, Jim and Helen Sloop, are in very good health and are around the bakery on a regular basis helping my husband, Ken, and myself with the shop. Our son, Ken Jr., the third generation, is also on staff. Since the very first day The Sweet Shoppe opened, my family's aim has been to give every customer the very best quality in bakery goods and the most professional and friendly service. We scratch bake almost every item in our bakery. We use only the finest ingredients available to insure a product that you can be proud to serve to your family, co-workers, or guests. If you're a current customer, we thank you for your patronage. Tell us why you love The Sweet Shoppe Bakery and we may put your comment on our web site. If you've never been to our bakery on Centennial Street, you are in for a treat! We offer special items according to the season - there's always something new to taste - and invite you to come in and sample our goodies. One taste, and we know you'll be back... after all, every bite's a delight! Our family looks forward to serving you and your family!